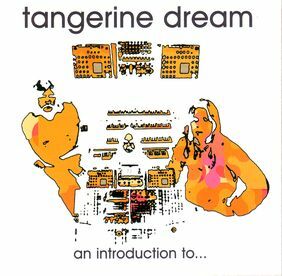 An Introduction To.... is, after The Best Of Tangerine Dream, From Dawn 'til Dusk, The Story Of Tangerine Dream, Atmospherics and Journey Through A Burning Brain, another compilation featuring a strange mixture of tracks from 'The Pink Years' and 'The Blue Years'. Like the other compilations mentioned it does not contain any composition of the inbetween 'Vigin Years' era due to copyright issues. The 8-page booklet contains two monochrome photos of the line-up Edgar Froese/Chris Franke/Peter Baumann, an almost complete discography ranging from Electronic Meditation (1970) to East (2004), including even most of the rare soundtrack albums, and a short biography of TD by Paul Russell, which is accurate in most parts though it makes Johannes Schmoelling an Austrian (obviously mixing him up with Paul Haslinger) and ends in the late eighties with Jerome Froese joining the band.